Old Masoretic work in which the notices and rules of the Masorah are collected; it consists of groups of rare words or of certain peculiarities of the text arranged either alphabetically, or in the order of the books of the Bible, or according to some other principle, and contains also brief rules and notes on various phenomena found in the original text of the Bible. 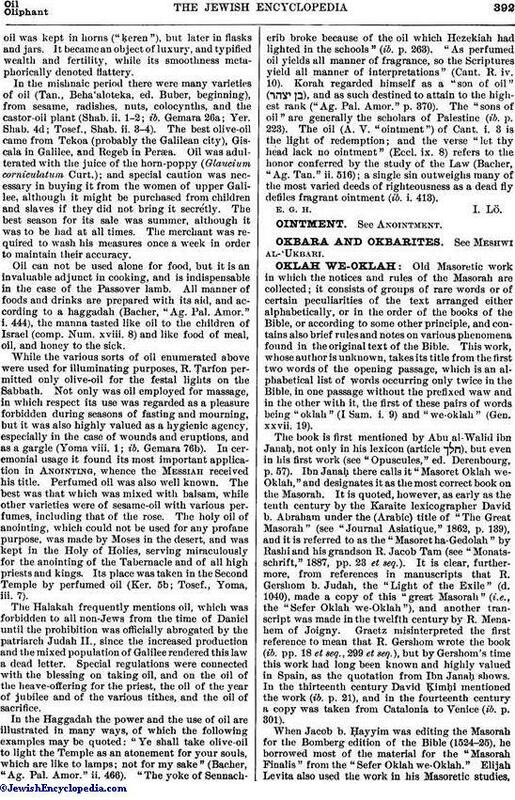 This work, whose author is unknown, takes its title from the first two words of the opening passage, which is an alphabetical list of words occurring only twice in the Bible, in one passage without the prefixed waw and in the other with it, the first of these pairs of words being "oklah" (I Sam. i. 9) and "we-oklah" (Gen. xxvii. 19). The book is first mentioned by Abu al-Walid ibn Janaḥ, not only in his lexicon (article ) but even in his first work (see "Opuscules," ed. Derenbourg, p.57). Ibn Janaḥ there calls it "Masoret Oklah we-Oklah," and designates it as the most correct book on the Masorah. It is quoted, however, as early as the tenth century by the Karaite lexicographer David b. Abraham under the (Arabic) title of "The Great Masorah" (see "Journal Asiatique," 1862, p. 139), and it is referred to as the "Masoret ha-Gedolah" by Rashi and his grandson R. Jacob Tam (see "Monatsschrift," 1887, pp. 23 et seq.). It is clear, furthermore, from references in manuscripts that R. Gershom b. Judah, the "Light of the Exile" (d. 1040), made a copy of this "great Masorah" (i.e., the "Sefer Oklah we-Oklah"), and another transcript was made in the twelfth century by R. Menahem of Joigny. Graetz misinterpreted the first reference to mean that R. Gershom wrote the book (ib. pp. 18 et seq., 299 et seq. ), but by Gershom's time this work had long been known and highly valued in Spain, as the quotation from Ibn Janaḥ shows. In the thirteenth century David Ḳimḥi mentioned the work (ib. p. 21), and in the fourteenth century a copy was taken from Catalonia to Venice (ib. p. 301). When Jacob b. Ḥayyim was editing the Masorah for the Bomberg edition of the Bible (1524-25), he borrowed most of the material for the "Masorah Finalis" from the "Sefer Oklah we-Oklah." Elijah Levita also used the work in his Masoretic studies,describing it as a book small in size but great in value ("Masoret ha-Masoret," ed. Ginsburg, Introduction, p. 93). For three centuries it was supposed to be lost, until it was published by Sol. Frensdorff from a Paris manuscript (Bibliothèque Nationale, MS. No. 148), under the title "Das Buch Ochlah W'ochlah" (Hanover, 1864). This edition led to the discovery of a second manuscript of the work in the library of the University of Halle, by H. Hupfeld, who described it in the "Z. D. M. G." (1867, xxi. 201 et seq.). Graetz, comparing the Frensdorff edition with the Halle manuscript ("Monatsschrift," 1887, pp. 1 et seq. ), showed that the unedited version of the work contained an earlier and more complete text, and also that the version used by Jacob b. Ḥayyim must have differed from the two preceding recensions. In the Halle manuscript the material is logically arranged in two orders, although this division is not observed in the edition. The manuscript, with which the passages quoted from R. Gershom's copy, as well as the citations in Rashi, agree, includes more than 500 numbers instead of the 374 numbers of the edition, whence it is evident that in the course of time the "Oklah we-Oklah" received several revisions and amplifications, as R. Jacob Tam had already pointed out when he said ("Hakra'ot," ed. 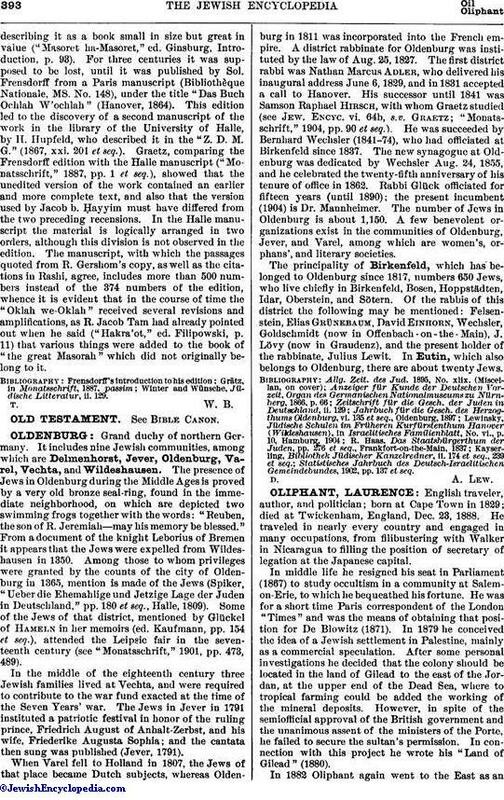 Filipowski, p. 11) that various things were added to the book of "the great Masorah" which did not originally belong to it. Winter and Wünsche, Jüdische Litteratur, ii. 129.